Hello, I have been using Project64 for awhile. It's fun to play N64 games but there is something missing. I can't seem to get rumble to work properly on my Xbox 360 Controller. The Controller is wired, and I got XInput working and my controller rumble works with all my other emulators that support rumble, besides Project64. I use N-Rage Input Plugin V2 1.80a. I would use the new version but every time I save it stops responding and everything I configured gets lost. 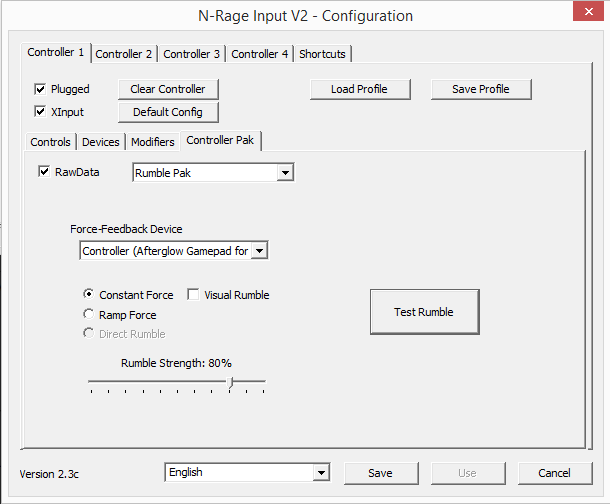 Though it does seem it noticed my controller rumble, because when configuring, I can see in the rumble box the option for Constant or Ramp, and to change the rumble strength, but it does not rumble. Sorry if this is a big block of text. I am using the most recent Project64. If it's any help I am running Windows 8.1 Pro 64-bit. If everytime you save it freezes. Its because your Config folder doesn't have read/write access. Make sure you have administrator access for the Project64 folder. Ah, it seems like it was too secure. Thanks. Anyway, I have tried testing the rumble and configuring the plugin well. The rumble does not work at all. I can select the controller, but it won't rumble. Same problem. I can get rumble working with these settings. My settings, and rumble is not working. Does the controller rumble when you run the test from the device menu in Windows? Frank is also using a later version of the plugin. Have you tried that? Last edited by theboy181; 18th April 2015 at 08:08 PM. Yeah, I'm using the version from 2.2.0.3. But I'm NOT using XInput. Maybe a problem using XInput? I think you should be able to set up your controller without XInput. It seems that you might have the Mem Pak selected instead of the Rumble Pak ticked on, maybe this will help. I need XInput to even use the device. I can't configure it with XInput disabled. its an updated driver package.